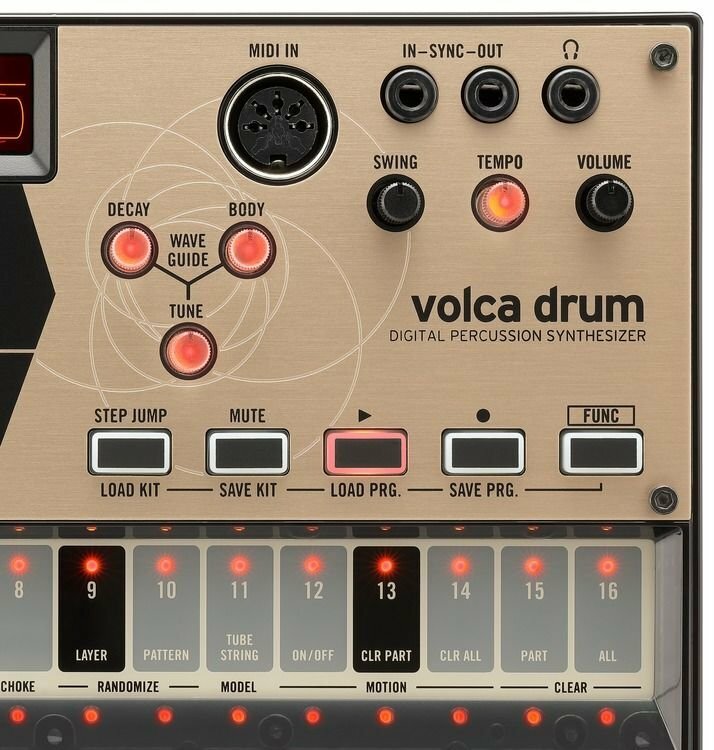 Why search for the perfect electronic drum sounds when you can create your own with the Korg Volca Drum physical-modeling drum synthesizer? This powerful percussion synth offers six dual-layered parts for you to create everything from commanding kicks and snappy snares to all manner of booms and blasts. 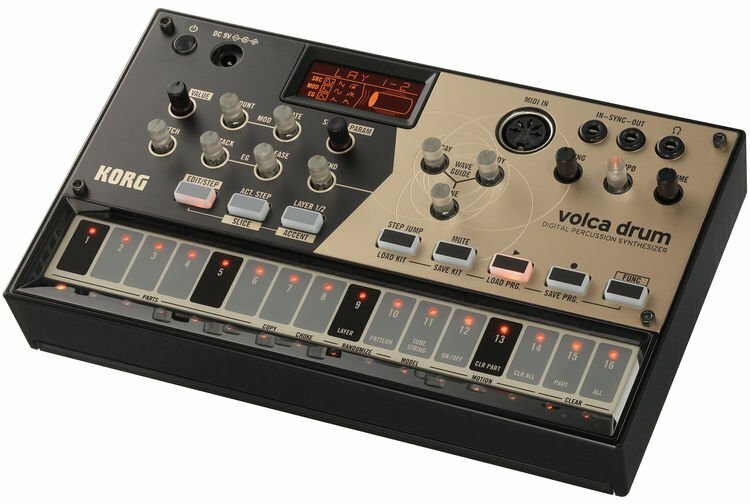 In typical Volca fashion, the Volca Drum features an impressive sequencer and 16 motion sequencer parameters to make grooves that move. 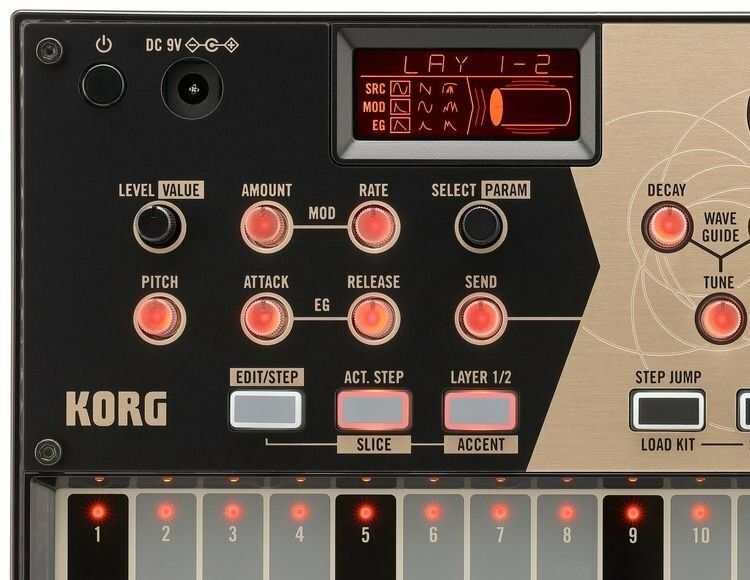 And each sequencer part can have a different sequencer, making it easy to create complex polyrhythms with the Korg Volca Drum percussion synthesizer. Each of the six drum parts in the Korg Volca Drum features two layers with five types of oscillator waveform per layer. Choose from sine wave, saw wave, or highpass-filtered noise, then choose from three types of pitch modulation and amplifier envelope. Complete with bit reduction when you want to get rough, Volca Drum allows you to create everything from deep bass booms and snappy snares to all manner of experimental percussion tones. The effects section in Volca Drum offers a waveguide resonator based on physical modeling, and synthesists are impressed by the complex tones you can conjure here. Its Tube mode applies the resonance of a cylindrical object like a drum body or a long pipe. The Strings mode generates the metallic resonance of a string. Volca Drum’s 16-step sequencer offers a ton of performance potential. Record in real time or via step recording, then chain patterns to play multiple sequences consecutively. In addition to your patterns, you can use the motion sequencer to control up to 69 different parameters. Another much appreciated addition is the ability to subdivide any sequence step into shorter slices to create drumrolls.